WASHINGTON, DC, August 6, 2014 (ENS) – Hundreds of thousands of activists plan to head for New York City on September 21 to take part in the People’s Climate March ahead of the United Nations Climate Summit. They hope it will turn into the largest climate protection rally in history. 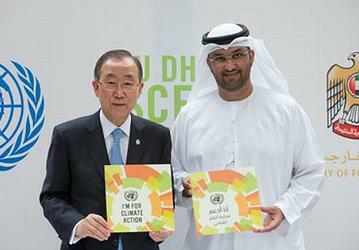 There, at the invitation of UN Secretary-General Ban Ki-moon, heads of state will meet on September 23 to discuss a global pact to limit the greenhouse gases responsible for climate change. Ban has been traveling around the world to build consensus among governments on a legally-binding global agreement to reduce greenhouse gas emissions. The agreement is due to be signed in Paris at the end of 2015. It would take effect in 2020. One marcher, Steve Martin, 60, of Henderson, Kentucky, is being sent by the nonprofit Great March for Climate Action as an ambassador ahead of the main body of marchers. He intends to arrive by foot in time for the start of the People’s Climate March. The Great March for Climate Action departed Los Angeles, California on March 1 and is scheduled to arrive in Washington, DC on November 1. On September 18, this group of marchers will board buses for New York City at the Indiana-Ohio border, taking four days off to travel to the People’s Climate March on September 21. Today, the Great March for Climate Action is about halfway across the country. Marchers will be in Des Moines on August 11 for a rally at the Iowa State Capitol. “We’ve been inspired by the dedication of our friends at the Great March for Climate Action, and we’re looking forward to marching in step together at the People’s Climate March this September 21,” said 350.org Executive Director May Boeve. The nonprofit group takes its name from what scientists warn is the need to decrease carbon dioxide concentration in the atmosphere to 350 parts per million. In June, scientists in the Scripps CO2 Program at Hawaii’s Mauna Loa Observatory measured the CO2 concentration at just over 401 ppm. Martin travels alone, without a support vehicle, pushing his gear in a stroller along highways. He arranges his own meals and lodging, either finding a campsite or stopping at a roadside motel. 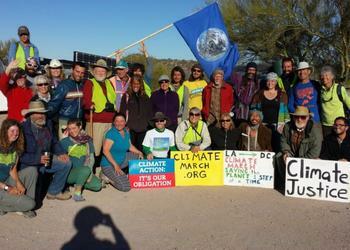 Martin left the other 34 full-time marchers in eastern Colorado on June 22, walking about 25 miles per day. The main body of the March continues at a pace of about 15-16 miles per day. A retired second-generation photographer with a preference for high-fructose corn syrup and meat, Martin last year walked the Camino de Santiago in Spain, but felt his journey was not over. The largest U.S. organization of nurses just announced it will participate in the People’s Climate March to New York City for the United Nations climate summit. National Nurses United leaders say they will emphasize escalating concerns about the health hazards posed by the effects of the climate crisis in the form of increased pollution linked to fossil fuel production, tar sands extraction and transport, fracking, severe weather emergencies from hurricanes, typhoons, and drought, and longer term problems associated with global warming. More than 550 environmental, labor, healthcare, and community organizations from the United States and around the world have endorsed the march. Companion events are being scheduled around the world.